Bradley Manning is a Hero – Free Him Now! We reprint below an Internationalist Group leaflet that was distributed, along with the article “Defend PFC Bradley Manning,” from The Internationalist (No. 31, Summer 2010), at the 1 June 2013 protest in support of Bradley Manning outside the gates of Ft. Meade, Maryland. Two days later he would go before a military tribunal on charges of aiding the enemy and violating the 1917 Espionage Act, which was enacted in order to jail socialist and revolutionary syndicalist opponents of the first imperialist world war. In his statement to the court-martial, Bradley Manning explained his horror (later shared by millions) at viewing the “Collateral Murder” video in which a Reuters photographer and driver were gunned down from an Apache helicopter in Baghdad while the bloodthirsty crew fired on a van with two children in it. The U.S. Central Command, then headed by General David Petraeus, refused to turn the video over to Reuters on a Freedom of Information Act request (claiming not to know if it existed). Manning’s action in releasing that video over to the WikiLeaks site was a courageous act and civic service to all humankind. Manning’s statement laid out how and why he provided damning evidence of U.S. war crimes in Iraq and diplomatic cables exposing U.S. skullduggery around the world to the WikiLeaks site which has earned the government’s enmity for publishing online information that the imperialists would like to keep hidden. Since the fact of Manning’s laudable action is not contested, the military prosecution instead mainly spent the first week of the trial fishing for anything it could use against WikiLeaks founder Julian Assange (see “Free Julian Assange! Drop All Charges!” The Internationalist No. 32, January-February 2011). No charges were ever brought against the cold-blooded killers in the Apache helicopter or the military brass who covered up their heinous crime. Meanwhile, U.S. commander-in-chief Barack Obama keeps on slaughtering innocent civilians from the air as he orders drone strikes against individuals on his “kill list” or others in “signature strikes” who happened to be in the wrong place at the wrong time. Yet Pfc Bradley Manning is being prosecuted for his heroic actions in a rigged military procedure with secret evidence and no right of appeal to civilian courts. 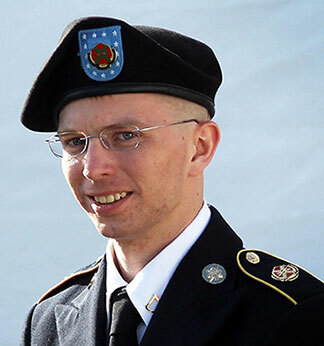 The “guilty” verdict in the Bradley Manning trial is preordained. Bradley Manning has become a symbol of honor, rectitude and humanity against a criminal government. Many who have demonstrated for his freedom voted for Democrat Obama in 2008 only to be bitterly disappointed by his actions in office, continuing and even expanding the despotic policies of the Republican Bush II regime. Appealing to such disappointed liberals, a banner of the International Socialist Organization at the Ft. Meade demonstration proclaimed, “Prosecute War Criminals – Not Bradley Manning!” The idea of this state prosecuting its war criminals is beyond delusion. It will take a revolution to bring the mass murderers to justice. As revolutionary proletarian internationalists, we say: Free Bradley Manning! Hands Off Edward Snowden and Julian Assange! A workers America will give them the honor they deserve. A court-martial is scheduled to begin on Monday, June 3 at the Ft. Meade Army base outside Baltimore, Maryland. In the dock is 25-year-old Private First Class Bradley Manning, an Army intelligence analyst who courageously provided the WikiLeaks organization with military reports, U.S. diplomatic cables and video documenting the wanton killing of civilians, children and journalists in Iraq by a U.S. helicopter Air Weapons Team. For us, and for all opponents of imperialism, Bradley Manning is a hero, while the criminals are the Pentagon chiefs who intend to convict him and their commander-in-chief in the White House. Manning has already been in prison for over three years since his 29 May 2010 arrest. For 258 days, from July 2010 to April 2011 when he was transferred to an Army prison at Ft. Leavenworth, he was held in solitary confinement at the Marine Corps brig in Quantico, Virginia. Pfc Manning was forced to remain awake from 5 a.m. to 10 p.m. in a cell where the lights were never turned out. During that time he was not allowed to lie down or to lean against the wall. He was forced to strip to his underwear and sleep under a blanket so coarse that it gave him rashes. Allowed only 20 minutes of “sunshine call” outside his cell per day, shackled hands and feet in a small concrete courtyard, Manning was not allowed to speak to any other inmates, while guards would question him and require him to respond, every five minutes of every day. This is torture. Bradley Manning hoped that “a detailed analysis of the data” – including reams of field reports with “records of over 120,000 civilian killings in Iraq and in Afghanistan,” as Wikileaks founder Julian Assange pointed out to the United Nations – “could spark a domestic debate on the role of the military and our foreign policy in general.” When the press showed little interest, he contacted WikiLeaks. The prosecution is expected to have a member of the Navy SEAL assassination team that killed Osama Bin Laden testify that the Al Qaida head, who waged an anti-Communist “holy war” on behalf of the United States against the modernizing Soviet-allied government of Afghanistan in the 1980s, had requested and obtained information from the WikiLeaks website. So? We have it on good authority that one Barack Obama, a k a POTUS, sought material from WikiLeaks.